Part of our Global Reef Expedition involves hosting education seminars and workshops in as many places as we can. For instance, in Jamaica we conducted a workshop for high school and college students about coral reefs and how they can begin their own conservation projects in Jamaica. 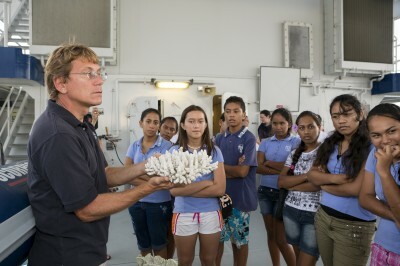 In Fakarava, French Polynesia students toured the M/Y Golden Shadow and got a firsthand look at how we conduct research. Several Skype calls and Google Hangouts have been conducted between scientists on the ship and students in the United States. This allows students to speak one-on-one with a scientist in the field. Sharing our knowledge of coral reefs throughout the world helps us to promote awareness, conservation, and preservation. We hold workshops several times a year to introduce teachers to our Coral Reef Ecology Curriculum. Hosted on a state-of-the-art online learning platform, this curriculum is a comprehensive educational resource for teachers and students interested in learning about coral reefs. It includes a wide variety of educational materials including custom-built interactive exercises, lesson plans, educational videos, and quizzes, all aligned to the latest education standards (Next Generation Science Standards, Common Core State Standards, and Ocean Literacy Principles). Participants learn how coral reefs can be used to teach about everyday topics, such as classification, mitosis, and symbiosis. These workshops are appropriate for middle and high school informal and formal educators. We are partnering with the National Aquarium to provide the next Corals in the Classroom professional development workshops. They will be held at the National Aquarium in Baltimore, Maryland. Maryland teachers that attend both workshops are eligible to receive one MSDE Professional Development Credit. Part 1 of this two-part workshop will focus on coral biology and the biotic and abiotic factors that affect coral reefs. Part 2 of this two-part workshop will focus on the current state of coral reefs and the threats they are facing. In addition, you will learn how scientists study coral reefs and take part in a coral reef survey simulation. The cost of the training will be free to educators; however, there will be a $15 registration fee per person, which will be returned after attending the workshop. Reservations can be made by calling the National Aquarium at 410-576-3833. 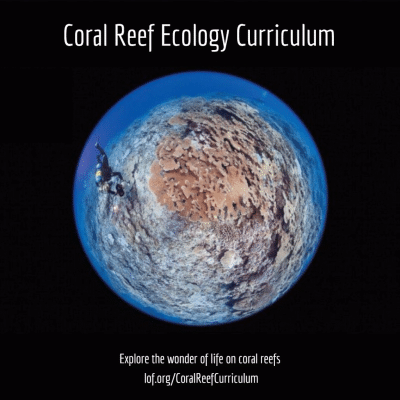 If you can’t make it to an in-person training, we have recorded a 30-minute professional development training that will walk you through everything you need to know to get started using the Coral Reef Ecology Curriculum in your classroom.